Folding Electric Bike Making Your Travel Convenient These days, motorcycle, cars and other fuel-based vehicles are being taken over by the more convenient, fuel saving, and stylish Electric Bicycle. People are getting more fascinated by the various contemporary model of bicycle. 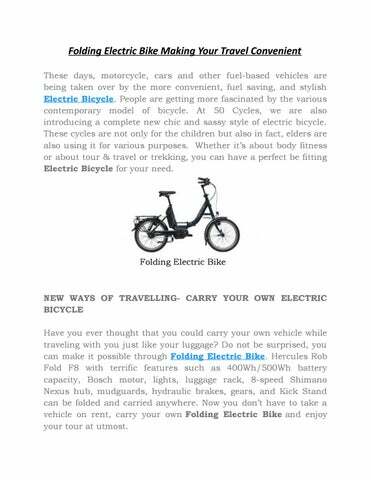 At 50 Cycles, we are also introducing a complete new chic and sassy style of electric bicycle. These cycles are not only for the children but also in fact, elders are also using it for various purposes. Whether itâ&#x20AC;&#x2122;s about body fitness or about tour & travel or trekking, you can have a perfect be fitting Electric Bicycle for your need. NEW WAYS OF TRAVELLING- CARRY YOUR OWN ELECTRIC BICYCLE Have you ever thought that you could carry your own vehicle while traveling with you just like your luggage? Do not be surprised, you can make it possible through Folding Electric Bike. Hercules Rob Fold F8 with terrific features such as 400Wh/500Wh battery capacity, Bosch motor, lights, luggage rack, 8-speed Shimano Nexus hub, mudguards, hydraulic brakes, gears, and Kick Stand can be folded and carried anywhere. Now you donâ&#x20AC;&#x2122;t have to take a vehicle on rent, carry your own Folding Electric Bike and enjoy your tour at utmost. With the inception of 50cycles in 2003, we are dedicatedly selling and supporting electric bicycle of a wide range of models. We are consistently helping a number of people to take themselves on the road without hurting their pocket and environment. You can visit our shop of Electric Bicycle physically at Bristol, London, Shoreham-by-Sea and you can enjoy free rides as well. 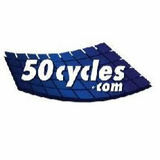 Check out more about our delivery process, free riding, clearance sale, models of bicycle and more at our online address https://www.50cycles.com/.